I came across lots of problems when the glass updated to XE12, long ago. Today I found out this article which I thought I would like to share with you all. My Glass was automatically updated with the monthly update XE12. This update included a new version of GDK implementation, known as Sneak Peek Rev. 2. Since the update, I could not run any of my GDK sample apps. I was getting errors like: java.lang.NoSuchMethodError: com.google.android.glass.timeline.TimelineManager.getLiveCard. As it turned out, this new GDK revision included some non-backward compatible API changes. Clearly, names like “Sneak Peak” or “Preview” edition imply they are not stable releases, and APIs can change any time. But, I was caught a bit off-guard, and a bit disappointed since it happened “without warnings”. (Or, maybe there was a pre-announcement, and I may have missed it because I’m off-line most of the time these days.) I mentioned the importance of “backward compatibility” in software engineering a few times before. Even more importantly, I believe that software engineers should strive for “forward compatibility”. This is a difficult goal to attain because, in many cases, developers do not know what product features they will need to support in the future. In most organizations, they come down from “PM’s” or people from “higher up”. Nonetheless, I think it is possible, and it is worth pursuing. Anyways, I went through all my sample apps on GDK Demo and updated the code based on the new API. I’ll include the list of API changes here. This is only a partial list since the GDK Demo apps use only a subset of the GDK APIs. First, you’ll need to update your GDK using Android SDK Manager. Since the original GDK release about a month ago, there seems to have been no other Android updates. When I opened the SDK Manager last night, it found only one update, GDK rev. 2. You can copy the updated gdk.jar file into your project dir and include it in your build path, or you can just set your compileSdkVersion to a GDK-specific string. I personally prefer the first approach because there are some benefits of using a higher version for compileSdkVersion than that of targetSdkVersion (which should be 15 at this point). If you plan to do any “cross-platform” development (e.g., your app targeting both Android phones and Google Glass), then you probably have no choice but to use the Jar file. So, here’s the list of API changes in GDK (as relevant to the currently “released” GDK Demo apps). LiveCard: It appears that the method setNonSilent(boolean) has been removed. Instead, this “nonsllent” flag is set during publishing. The signature of the method publish() with setNonSilent(true) has been changed to publish(LiveCard.PublishMode.REVEAL). If you used setNonSilent(false) for your livecard, then you now need to call publish(LiveCard.PublishMode.SILENT) instead. LiveCard.enableDirectRendering(boolean) has been changed to setDirectRenderingEnabled(boolean). com.google.android.glass.media.Camera has been, it appears, renamed to CameraManager. The surface rendering callback interface, LiveCardCallback seems to have been renamed as DirectRenderingCallback. My existing code just compiled fine (haven’t tried running them all though) after only changing the interface name. That’s about it. Again, this is only a partial list of API changes in the new “Revision 2” version of GDK (as relevant to the “GDK Demo” sample Glassware). I haven’t done any comprehensive comparison of old vs. new GDK jar files or anything like that (which is probably easy to do). Google might have posted some kind of “release note” or “change log” at this point (which I haven’t seen yet though). Meanwhile, I hope other GDK developers find my list useful, for now. PS 1: BTW, interface name changes like LiveCardCallback -> DirectRenderingCallback possibly imply that there might be something coming in the future that are in some way equivalent/similar to LiveCard (maybe, DeadCard? :)). This is known as “breaking backward compatibility for forward compatibility”. We developers do this all the time, whether we realize it or not. We create, say, a class for certain purpose (with a certain name), and later realize that we have chosen too specific a name because the class can be more broadly applicable than initially planned. Link to the GDK Release note – The GDK release note page. What comes with the new Google GLASS Development Kit? The GDK is an Android SDK add-on that contains APIs for Glass-specific features. Unlike the Mirror API, Glassware built with the GDK runs on Glass itself, allowing access to low-level hardware features. At the time of writing this article Sample GDK has been released out introducing ways to develop native android apps for Google Glass. 1. 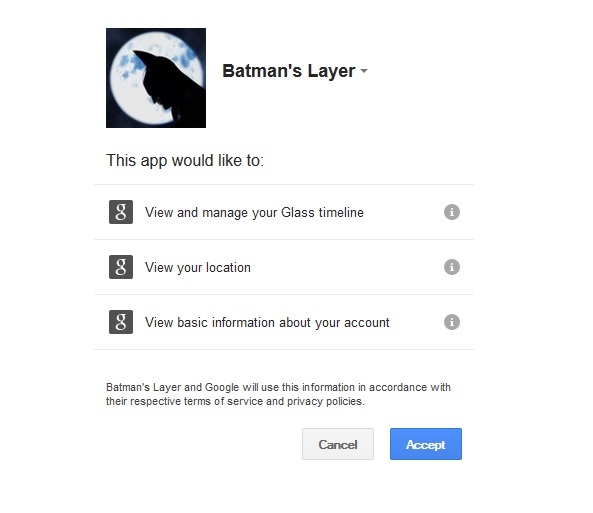 A new platform for you to develop your GLASS apps so it will have special libraries needed to for the Google GLASS. Not all are available yet, you have to wait for the final version to come. Ok guys today we will see how we can stream a Youtube video inside a google glass timeline card. First you need to add reference to the “YoutubeExtractor” namespace. You can get it from the nuget if you dont have it. Now add the youtube video url to atring(The url you got when you clicked the share button not the page url). Resolve the url and get the links for the available videos. Select the video you wanted to stream and get the stream url. Create a stream using the link we got, create a http request, buffer it and insert the card mentionng the video type. Ok, developing apps and glassware for Google Glass seems to be not a big deal……! But there are some hidden issues we have to take care of…! 1st one is Battery and the 2nd one is Performance…! Even though the Google said the Battery will last for 1 Day, I could not experience the glass battery as long as that, unless it was left to sleep. When the Battery was full, I started taking a video, I got warning in 20 minutes saying battery is low, that’s it, I have to stop taking video and shutdown the glass. Here is the Video Taken. So you must have understood, how poor the battery life is in Google Glass. So running a native Android is really a battery draining factor, specially pairing to phone through Bluetooth. 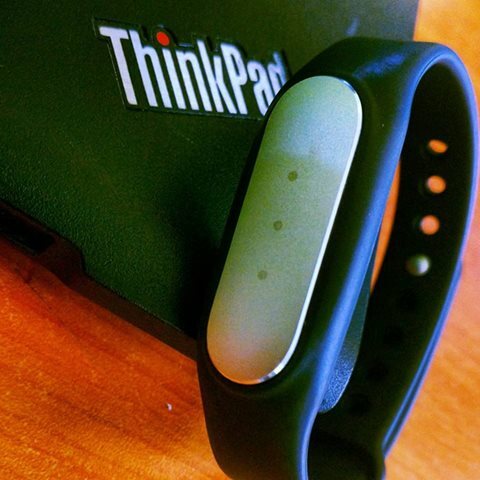 And if you are using any sensors in the glass then that will cause heavy battery usage. Alternatively we can do something like, keeping down the brightness of the display, and put the glass to sleep at most of the time(When app is idle). Avoid doing heavy process in the glass by sending the data to a server and process it and get the result. I have read some people’s review say, using Glassware can solve the battery problem. Yes, as it is a plain html card which does not java script it won’t drain much battery. But anyway the cards are shown in web browser objects. Smart phone users know the battery drain very much when they use web browser. So If the glassware results are going to be shown in a series of web browser object which is called time line won’t it be draining battery very much? This point is just a conceptual thinking of mine. Even though we have discussed only some facts about battery, there are more hidden battery factors too. But some leaked patent doc shows possible 2 side battery increasing the battery capacity by double. 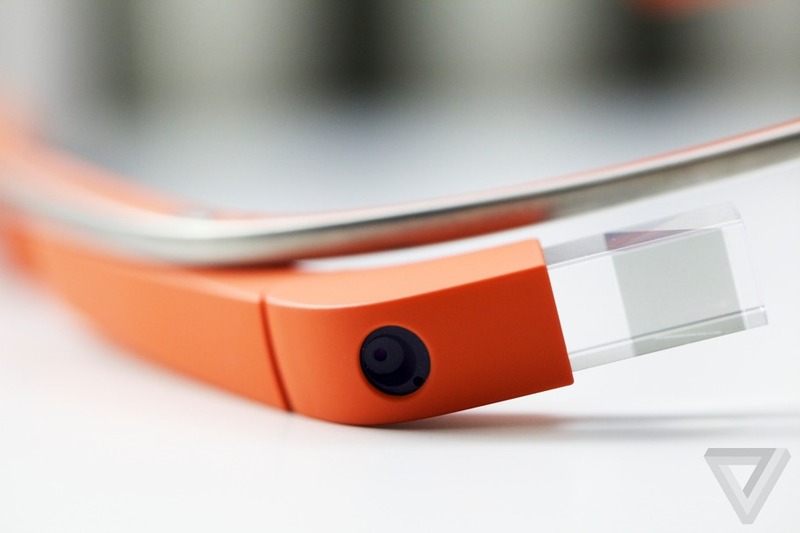 That’s all for today, catch you guys soon with more on Google Glass…! Basically the Google Glass runs Android OS. It means if you know Android(or Java) you can easily write apps for the glass. If you want a basic idea about what is google glass please read my previous post. But there are some important stuffs you have to look into and research, before you jump into the app development. With limited hardware resources, the capability of the devices is restricted. At the time of writing this article the Explorer Edition 7 update is released and we can do some stuffs like, take a photo, record a video, start a hangout, send an email, browse web and some other stuffs. The device is not like phone, where it does not have a touch display, the glass works by voice commands and mostly by tapping and scrolling the side of the glass. So you cannot expect to add buttons sliders. Still an SDK is not released to develop app for the glass. Well, we can start on with what Google Glassers have termed as “Glassware“. Glassware is a piece of software built on top of Google Mirror API. Google Mirror API is a set of Restful web services which help to communicate to and fro with google glass devices. Lets look at the diagram below to understand a little better. 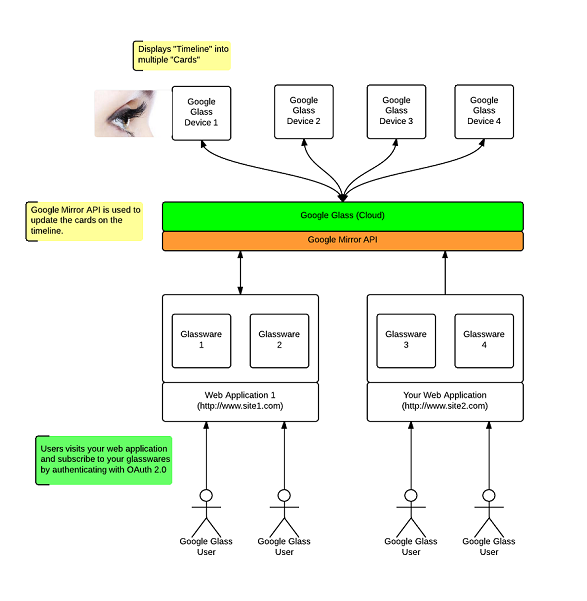 Above depicts interaction between google glass device and glasswares based on google mirror API. What one can do using Google Mirror API? 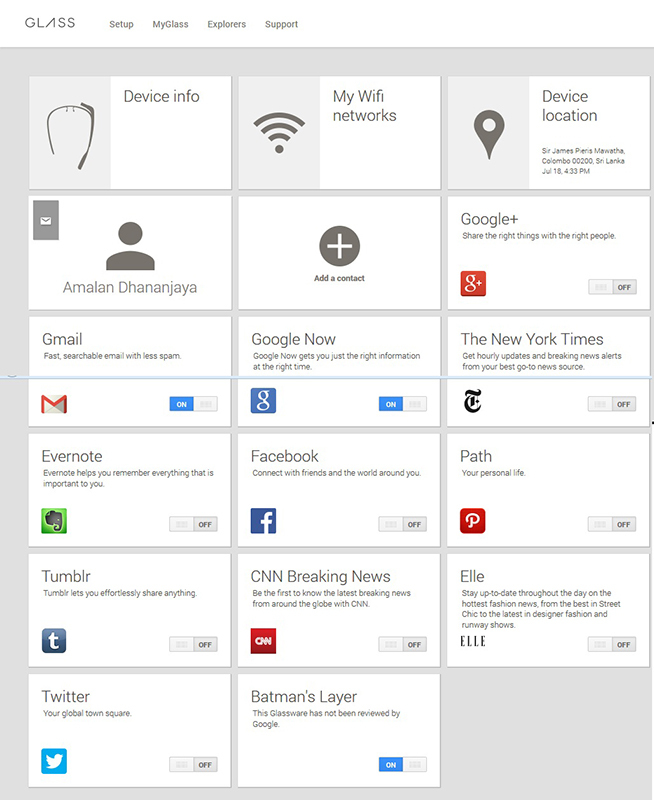 Glassware updates using Mirror API: Your google glassware then starts publishing to google glass cloud using mirror API. To be able to that, you must register your service with google cloud. 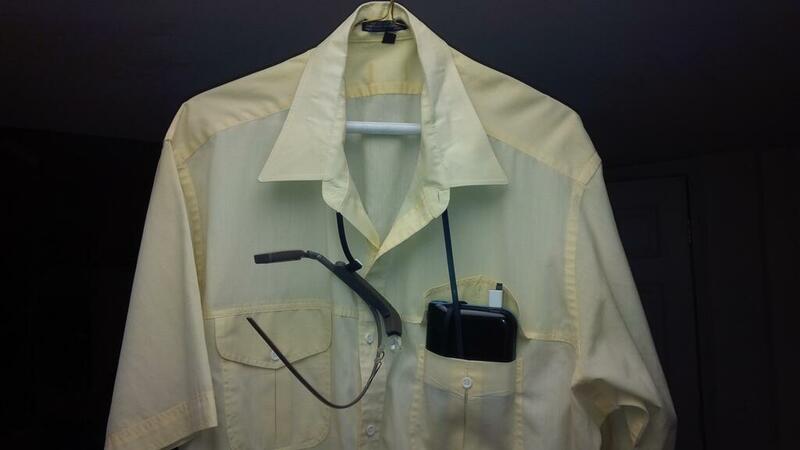 Google Glass synchronizes with glass device: This is third aspect. Once your glassware publishes to google cloud using mirror api, google glass then synchronizes your updates to your subscribed users. You can control the glassware sites you have subscribed by logging in to MyGlass account . You can access this with the MyGlass Android App too. In the above image you can see my glassware “Batman’s Layer” is listed with the other glasswares I have subscribed. Ok then In my next post we will see what you needed to start developing for Google Glass …!